Baglamukhi Mala Mantra benefits : Baglamukhi Mala Mantra is very well known for success in love, studies, money and business. 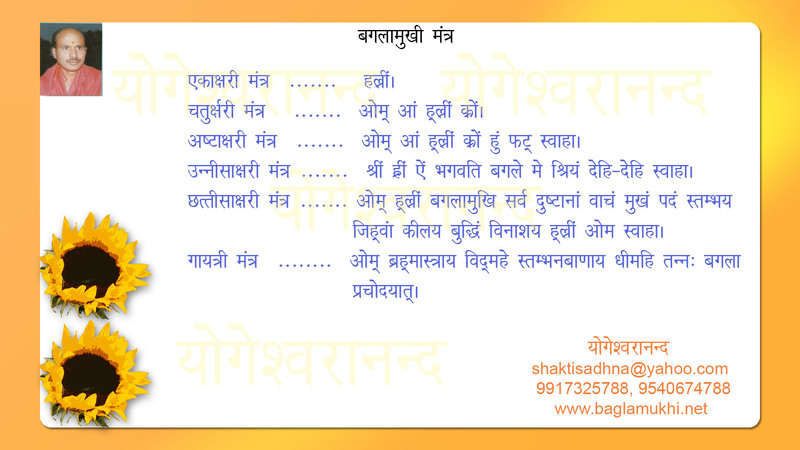 Baglamukhi mantra gives overall success in life. It is the best mantra to win in court cases. It is more effective in destruction of the enemies. Baglamukhi Mala Mantra is also used for Grah Shanti (Grah Dosha Nivaran). For ma baglamukhi mantra diksha and sadhana guidance email to [email protected] or [email protected] Call on 9917325788(Shri Yogeshwaranand Ji) or 9540674788 (Sumit Girdharwal Ji).